This product was sent to me by Vaporl, for the purpose of a review. The Profile RDA by Wotofo in collaboration with Mr.JustRight1 and advertised as the first “innovative” mesh rda. This rda however can also be used as single coil. The profile rda is 24mm overall in size, with a build deck of 20mm, the top cap is made out of stainless steel. The barrel does have thick walls, which in theory should give “better” flavor and prevent the rda from getting too hot or hot at all. This is a amazing theory, when it works, unfortunately in case of the profile rda it does not. 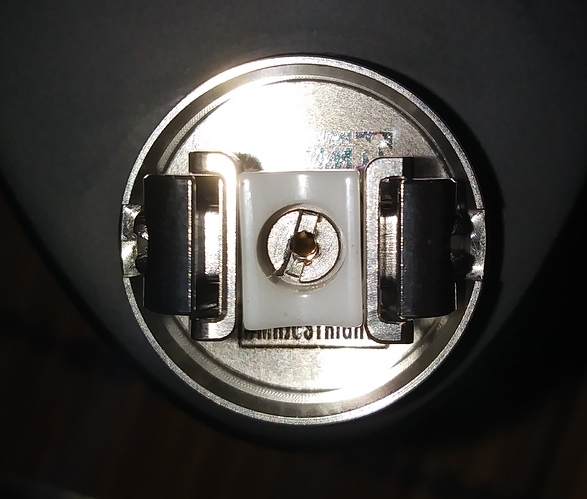 After chain vaping it for a little bit, the top cap gets hot rather quickly, surprisingly if you look at the airflow. 19 tiny holes are forming the honey comb airflow and even wide open, there’s a heat issue due to the massive amount of cotton. But more about that later. The deck contains a clamp style design, these clamps are not spring loaded, but open up fairly easily when the end of the mesh or the legs of the coil are pushed against it. In the center there’s a small spring with a ceramic block attached too it. This block is located right underneath the mesh, pressing the cotton firmly against the mesh, preventing dry hits. The juice well is not very deep and while this rda can be used as regular dripper, it’s advised to use it with a squonk mod. 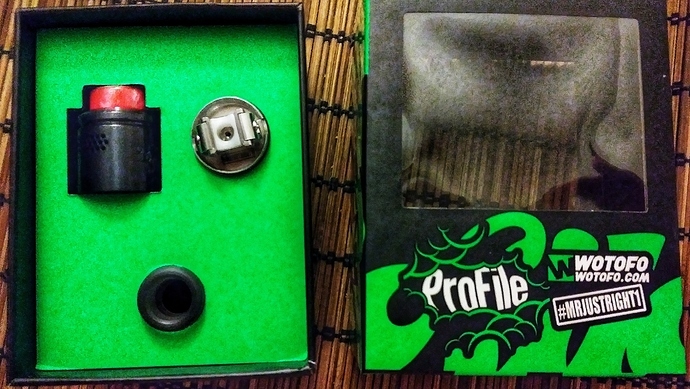 Wotofo includes a coiling jig/rod, that can be used as a bending tool for the mesh. All you have to do is, grab one of the mesh sheet and lay it on top of the rod. Gently pressing the mesh around it, this forms the arc and gives it the right size. Not much of a hassle here. After the mesh has been formed, slide the ends into the clamps and tighten the screws. 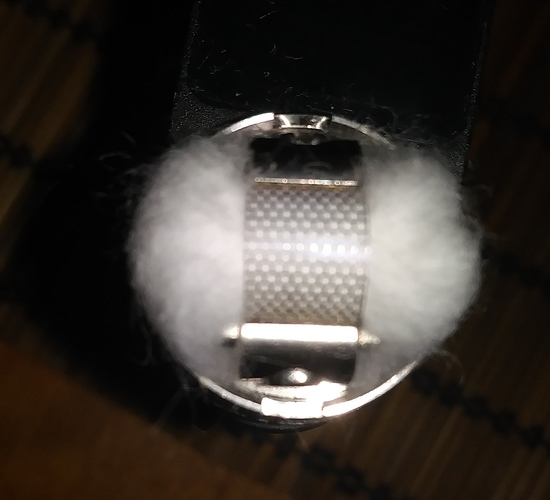 At low wattage pulse the mesh “coil” once and that’s it. 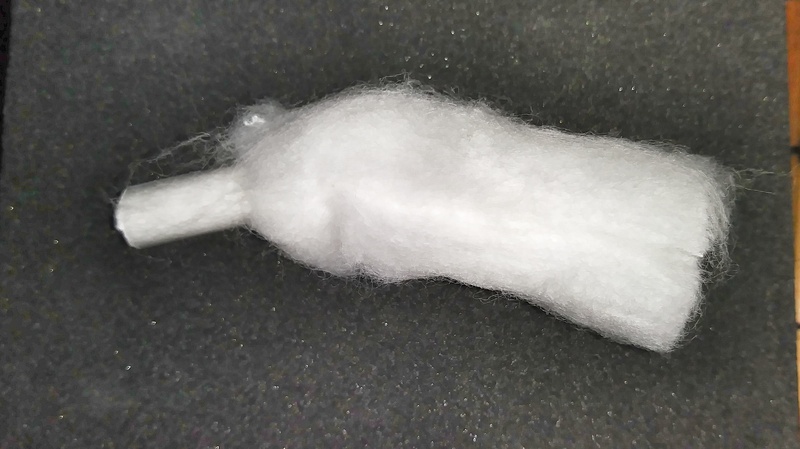 Moving on to the cotton, included as well inside the package, it’s what I call the shoe lace styled cotton. At 6mm width, this is much larger than any other cotton of this style on the market, but due to the spring loaded ceramic block, this is easily installed. Just slide it underneath the mesh, apply a bit pressure to the block, and pull the cotton through. Now this is the tricky part, getting the cotton just right. I guess that’s where the designer got his name from, because it’s not as easy as it might look. Cutting the cotton just long enough for it to lay inside the deck, still filling out the deck, but not too long for the cotton to dangle all up is a art in itself lol. Fluffing the cotton isn’t necessary since it comes already fluffed, but I would highly recommend thinning out the tails. Be careful not to remove too much cotton or you’ll end up with thin cotton, leading to spit back etc. Too much cotton, and you won’t be able to snap/lock the top cap in place, as well as getting muted flavor and dry hits. 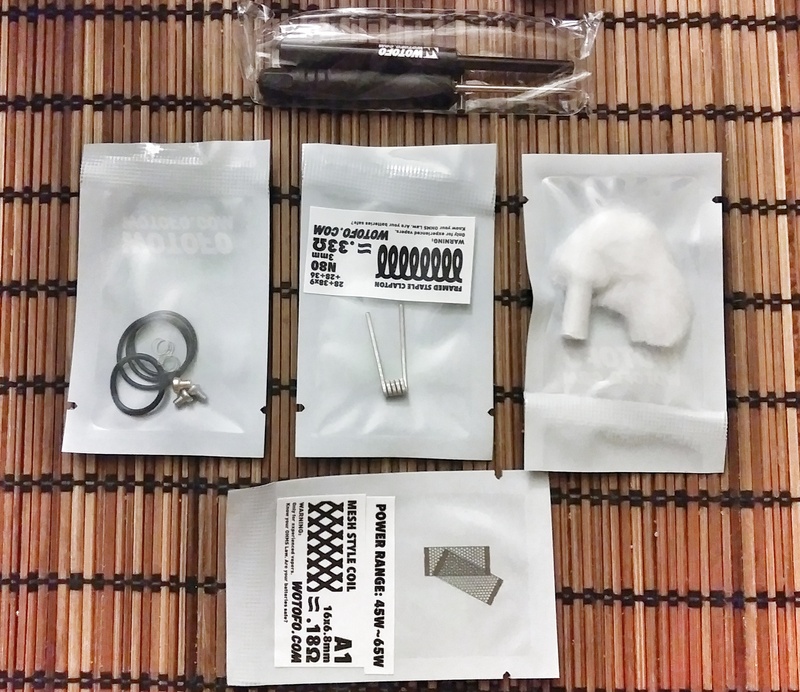 Wotofo doesn’t offer these mesh sheets/coils in stainless steel, and this was very disappointing to be quite honest. The profile rda is advertised as innovative and flavorful mesh rda, and while I don’t like mesh sub ohm tanks or rda’s, I still get more flavor from other brands, than this rda. The mesh is labeled as 40W – 60W, and while this heated up extremely well with zero ramp up, below 60W there was no flavor to be had. Even closing down the airflow the flavor was just missing. Going all the way to 60W was a bit better, but still not very satisfying for me. 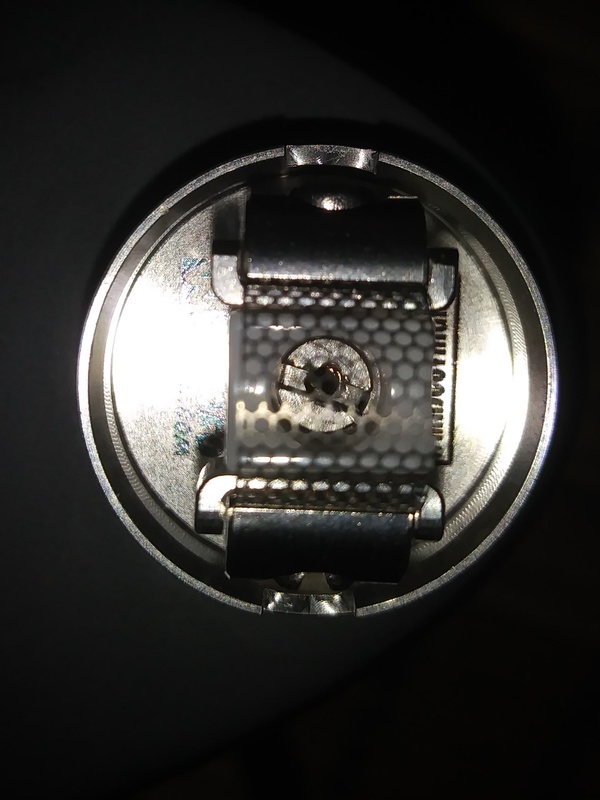 I take longer hits, and the top cap was just getting hot, the low drip tip wasn’t any help and made this just worse, switching to a bigger drip tip yield in even further flavor loss. Moving on to the airflow, this is a whole other dilemma in my opinion, even tho there are 19 tiny holes, overall the settings don’t give much options. You can either have it wide open, or the upper row partially/fully closed. The two rows beneath are not close able separately, but rather slide together to the left or right. This whole design makes the rda very airy. Worse when running it as a single coil, since you won’t have the whole chamber filled up with cotton in comparison to the mesh build, now you’re getting even more air. This is great for people looking for enormous clouds, not so much for the flavor chaser. The airflow itself, due to being the same color as the top cap and the thickness of the top cap, making it very difficult too see and adjust, especially with the darker colors. For single coil usage, there are also better options currently on the market. This is not for dripping, but more of a squonk rda, even then, make sure you own a squonk mod with a huge bottle lol. 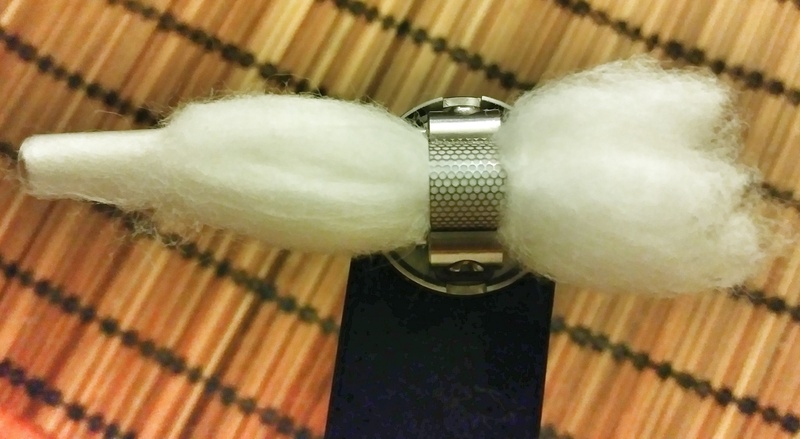 You’ll be constantly squonking because this mesh/cotton is hungry and need to stay saturated at all time. After all I am not very impressed and would say that this is just another over hyped product, that I feel I am beta testing. Is it innovative? Well in comparison to the products currently on the market, this definitely is easier to build on, does have that little ceramic block that keeps your cotton pressed against the mesh, but at the end of the day it could be better. This product works mostly with the cotton/mesh sold by Wotofo. With other brand products, while there’s a possibility to make them work, it is more of a hassle and doesn’t yield any better results in my opinion. 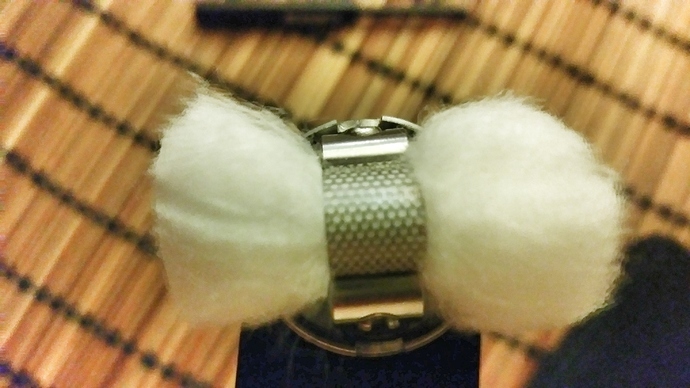 need to drip/squonk constantly due to the massive amount of cotton that’s needed. works “best” with mesh and cotton offered by Wotofo, not so much with other brands. Not the greatest rda when used with regular coils. I totally agree with your conclusions, over-hyped and flavor is not good at all. The idea of how the spring works to keep the cotton against the mesh is a very good one, just needs to be perfected. To be perfectly honest, I threw mine away as I didn’t need another RDA that I’ll never use. I enjoyed reading your review. Good and thorough, but our taste buds must differ. I got mine last week and haven’t been able to put it down. It uses up an awful lot of juice, and if and when you get a dry hit, it is awful. Not providing TC mesh is a definite WTF. Learning how often to squonk has been a tiny obstacle but now, for my vaping method, it’s now great. Thanks @eStorm grate read and pics! I just think the whole wicking method on the mesh RDAs is wrong. They’re going to have a better look at how mesh coil heads are done coz they work great. These big chunks of cotton collect all the juice in the middle where you don’t need it, and when your cotton degrades a bit, it’s not going to make good contact with the mesh. I have them same bamboo place mats. Love them. It made it a little confusing trying to focus on the review. Nice and shiny pics. Great write up! Nice review and so refreshing to see someone saying it as it is really. There are so much overly hyped stuff out there at the moment and reviewers and friends to the one releasing a product seem to do whatever they can to hype the products even more. Sad really since the ones loosing out on this is the people buying the stuff. Great read and pictures @eStorm. I do own a Profile but I can’t say much about it yet, I’m still waiting for my Desire Rage to try it out. The single battery Recurve is not really good testing material for it. Well done review! Great pics and well articulated observations. Especially appreciate your willingness to share your observations even though they do not concur with other published materials. Keep up the good work!! Thanks for the review. Well done!!! I’ve got two Profiles. It most definitely can be airy and I prefer tight draws. Mine has three open holes on each side and it’s perfect for me. I agree that it’s a pita having to take the top cap off to see the hole alignment, but once it is set it doesn’t move, so it’s really a non-issue. I’ve never used Kanthal until getting these. I’m not getting any unusual tastes from it. I think the knock against Wotofo not providing SS mesh is really off the mark. What manufacturer provides coils in multiple metals with their RDAs? Today I received 200 SS mesh and I’ve got it in right now, on TC on my Inbox VT. It’s working just fine. As for the heat, I’m not getting that at all and I can and do chain vape with the best of them. I really don’t like short and wide drip tips but they work fine. Also, I’ve changed the drip tip on just about every RTA and RDA I own because I have certain types I like. Again, it’s something a lot of people do already so it’s a small, at best, issue. Yes, it uses a lot of juice, but not ridiculously so. If I were buying commercial juice, it might limit how often I would use this RDA, but like so many here, I make it by the liter for pennies per ml. The way I see it, I make juice to vape and if I go through 15ml in a day with this RDA vs 10ml with some other RDA, it’s a non-issue as well. I initially used the cotton it came with and replaced it the next day with Rayon. I’ve been using that exclusively which is interesting because I didn’t care for using it even though I’ve had it for damn near two years. But in this RDA it works great. Even on watt mode I’ve gotten just a few dry hits (they are nasty as can be though), much, much less often than I usually get on my other RDAs as I do tend to be absent-minded when squonking. Either I squonk too much or not enough, especially when driving. Which brings up a pro and that this doesn’t leak. I’ve tried to get it to do so and it hasn’t yet. For me, that’s a huge check in the plus side. Finally, the flavor is as good as any RDA I own. I’ve got almost 30 of them, including most of the most popular over the past two years. This RDA delivers great flavor consistently. I will say though that it took a few tries to get the wicking correct, but isn’t that true of everything on the market? I’ve seen a few overhyped things as well, but, imho, this isn’t one of them. Thank you everyone for the feedback, very much appreciated. I’d like to say, that I have tested this rda nearly 3 weeks now on a daily basis. 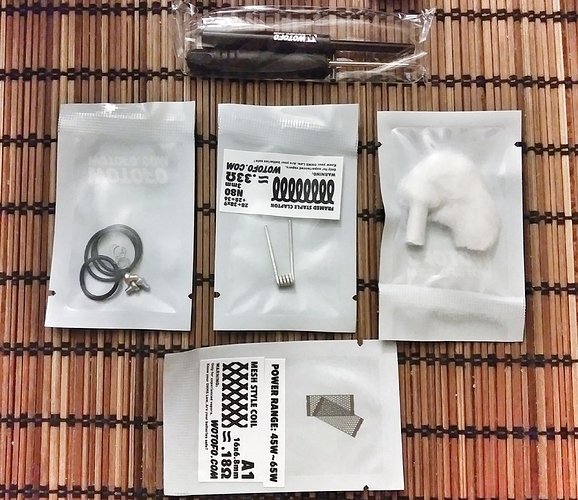 I did purchase SS mesh, as well as a bunch of different cotton brands, from shoe lace to regular and not just sticking with the provided or my usual used kendo gold cotton. Making sure I give the profile a fair chance. 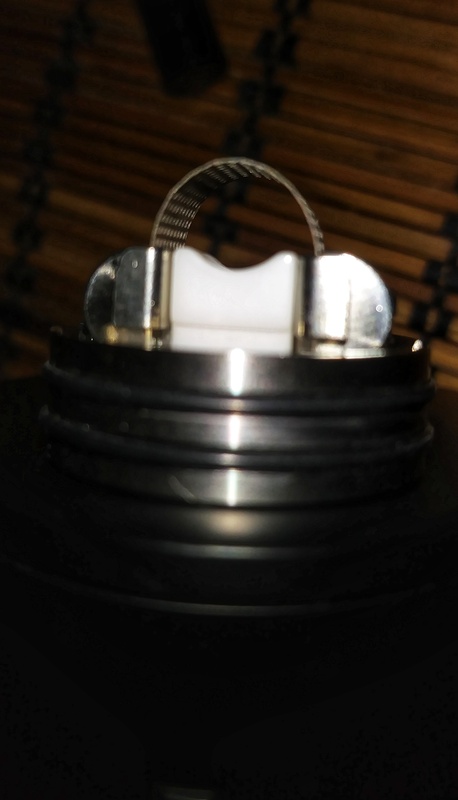 Tried it with SS regular coils also in different sizes, fully different builds, heights and what not. TC, Watt - high low, even higher and lower. Different juices from my own diy, to going out and purchasing commercial, just to make sure I cover all bases. Since it was questioned, hope that answered that. We vape all different, this is my experience with the product, I am sincerely happy for people that can enjoy the product. I am unfortunately not one of them. Let me be clear too, I am not criticizing you or your review, I only have different observations and conclusions. I have great admiration for anyone that takes the time and has the nerve to do a review. Its a lot of work. And I know how you feel. There has been hardware in the past that it seemed everyone loved, and no matter how many different builds I tried, it just didn’t work for me. 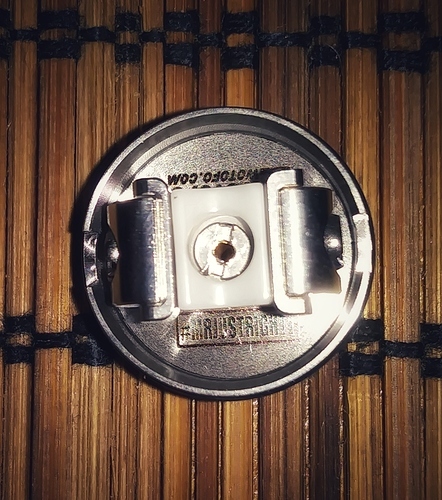 @eStorm…an honest review if I’ve ever seen one. Thank you for a your candor. I was ready to add this to my collection after reading Pug’s review a few weeks ago, but just decided to hold off before even reading yours. I think it’s good to have opposing views on certain things likes vape hardware, as it makes for a better informed consumer. Now I just have to figure out if I should pop for one or not. Thanks for your review and great information! @eStorm thanks for the review. Nicely detailed. Absolutely love the differing personal opinions on ELR. Great Review @eStorm, absolute hype , mine is sitting, collecting dust with a few others. The time and effort doing review like is highly valuable. And everyones preferences are 100% valid.